Hello and thank you for reading my blog! Today I'd like to start out my post with a special shout out to my Dear Sister... it is her birthday! Feel free to leave her a bday greeting in my comments section. She has been one of my most faithful readers and I love her very much. HappyBirthday Sista K! Enjoy your cake! Welcome to Second Chance Tuesday! 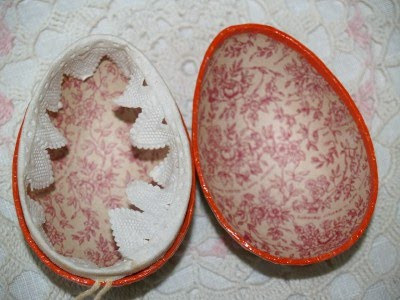 Today I'm showing an old paper egg. 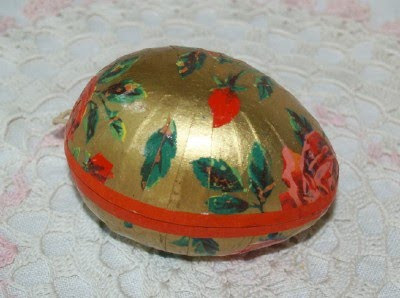 Its original purpose was the hold candy at Easter time. I thought it was perfect for my Bella Rosa shop because it is decorated with rose paper. The inside is another sweet surprise...red toile paper and the teensy print reveals that it is made in Western Germany. How sweet! A candy collector or someone who collects Easter eggs would love this piece. It definitely deserves a second chance. It is available at a reduced price during my SPRING FLING sale in my shop, here. 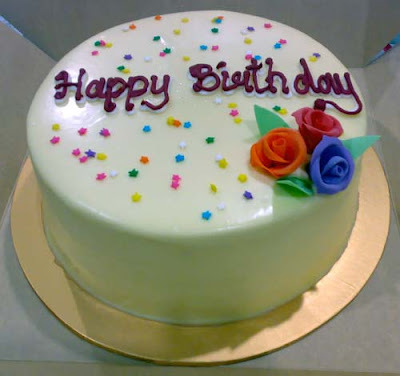 Happy Birthday to your dear sister. Glad you have each other! Happy Birthday to your sister! I didn't realize you had a linky party. Have you always had this? Adorable egg! 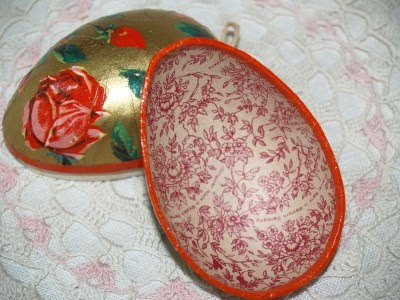 The decorated egg is wonderful! Loved how it looks opened. Hi! I'm Jill, a Mom running her own brick and mortar shop, an online antique shop, a house with an elementary schooler, and I love to hunt down vintage stuff with my Hubby! With a career behind me in TV as a Writer/Producer, I still like to write, so I have this blog. Follow along and see what vintage adventures I'm up to! And it only cost me a dollar! Where Bloggers Create Linky Party 2014: The Office & Craft Space Reveal! Brocante Treasures | An American living in France and collecting treasures at brocantes and markets around France. Faith is man reaching up! Click Below to follow My Antique Tweets! What Is It About Old Stuff? Latest Arrivals: In the Pink!